Chip Schwartz of KnightArts reviews the third in the series of this year’s Fleisher Wind Challenges. Leslie Friedman fills a huge portion of the gallery space with large, structural installations, which are interestingly as much a product of printmaking as they are modular assembly. Her sensibilities are strongly informed by the strategies of Pop Art, full of bright colors, repetition, text and recognizable images of celebrities (in this case a scientific one: Albert Einstein). 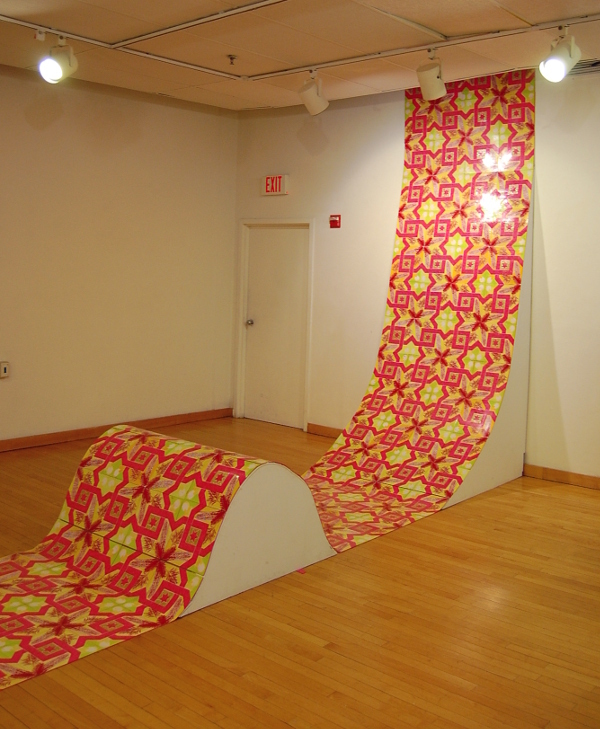 Although Friedman in many ways seeks to oversaturate, the pieces are quite entertaining, encouraging viewers to walk over, around, and even enter them. The lengthiest individual work is a sort of skateboard ramp covered in colorful patterned tiles entitled “Sukkot Ramp.” Elsewhere a tent with lights and interior seating area called “Shtetl” provides rest amidst the other more active pieces. Through images of the Star of David, Einstein, and printed phrases like “Oy Vey!” it should be clear that Friedman is very interested with Jewish culture and politics – in fact, she describes herself as a student of both art and political science. Her titles invoke Jewish holidays and the Eastern European towns where Yiddish speaking Jews thrived prior to the Holocaust, so while the exhibit appears to be all fun and games, there are graver examinations of identity hiding just below the surface as well. To read the entire article and more about the other two artists, click here.